Africa Adoption Story: Adoption is Doable! Home / Adoption Stories / Africa Adoption Story: Adoption is Doable! A child being part of a family is bigger than any special need. 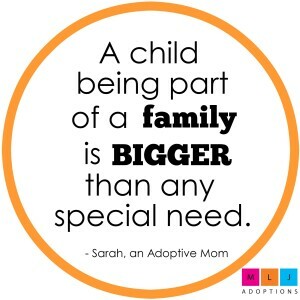 We encourage others to see that adopting a child with special needs is possible! It is our immense pleasure to introduce you to the Price family! 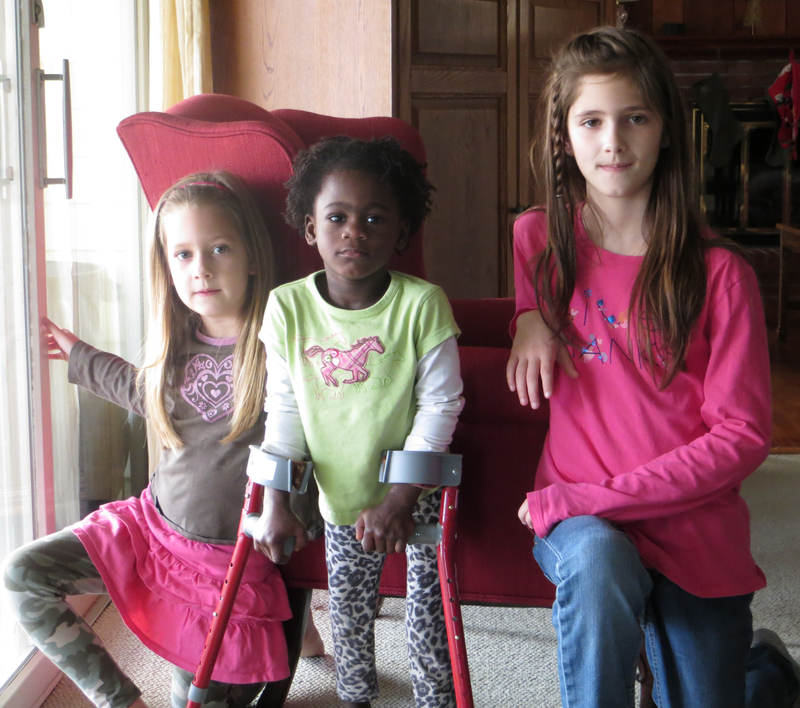 The Price family had four biological children at home when they decided to adopt a beautiful little girl, Della, through our Congo, Special Needs Adoption program. Della had polio as an infant in Congo which resulted in a partial paralysis in her left leg. Della came home in the summer of 2013 at 22 months old. Adoption is doable We were introduced to the idea of international adoption through friends who had adopted from Guatemala and DRC. From them, we learned adoption is natural and doable. We recognized that there is such a tremendous need in Congo and we have so much. We felt called by God to adopt and to share what we have with a child in need of a family. Della fit right in Our four biological children were excited about Della coming home. They immediately jumped in to assist her. It was like I came home from the hospital with her – very natural. We strongly feel that God matched us to Della. Some family and friends were initially uncomfortable about the idea of adoption because it was new to them, but once they met Della face to face they fell in love with her. Now she is just like any other American child. She loves to play with her dolls, read and talk. She is quite the talker! 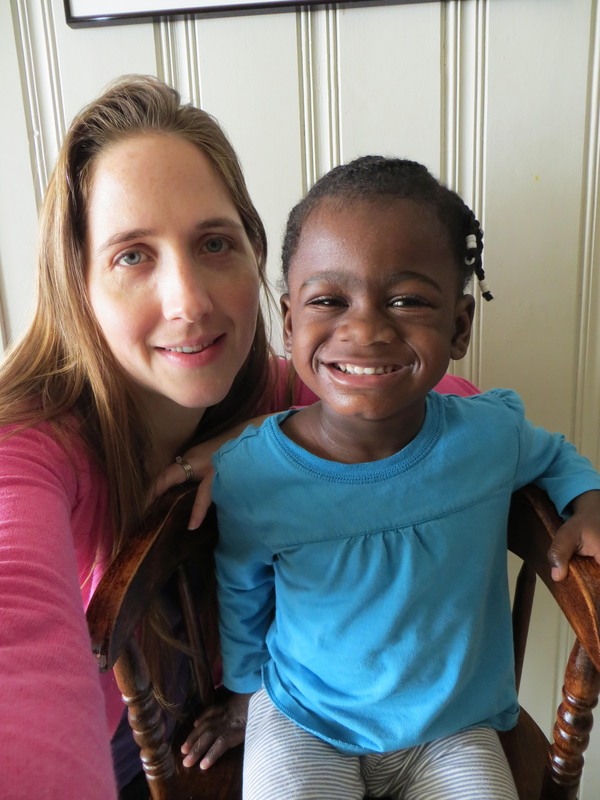 So thankful for her foster mother Mama J., her foster mother in Kinshasa, treated Della as if she was her own child. Della received very good care and she clearly learned how to bond while being cared for by Mama J. We feel this helped Della make the transition more easily to our family. Traveling in Kinshasa At first we weren’t happy when we learned we would have to travel to Kinshasa to pick up Della due to the logistics of caring for the rest of our children. We had also never traveled outside of the U.S. But, that trip gave us a whole new perspective. Seeing her birth country was life-changing. The people there are in survival mode. It’s such a different way of living and so hard to see their struggles. Traveling on their roads is a constant roller coaster. They make their own lanes, drive on sidewalks and people just walk right into the streets between the cars. We hope to travel to DRC when Della is in her early teens. We would like her to be able to see the country of her birth; smell the smells. Connecting her with her culture is something we strive to do. We keep her hair natural and celebrate her curls. We have connected with a local Congolese family and see them on a regular basis so that Della can know them and their traditions. Giving Back We can’t get the images of the orphanage in Kinshasa out of our heads. These images drive us to want to give back. Another adoptive mother and I started fundraising for the Global Orphan Foundation’s Pebble Project. We have such a heart for these kids. We raised over $16,000 in 2014, and plan to do another in the fall of 2015. We are so excited to be traveling to Kinshasa in early 2015 to assist in the project. 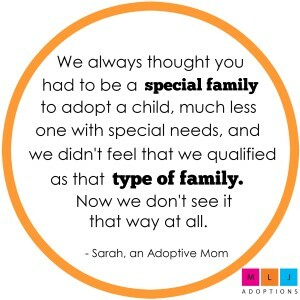 We aren’t special We always thought you had to be a special family to adopt a child, much less one with special needs, and we didn’t feel that we qualified as that type of family. Now we don’t see it that way at all. If we can parent biological children, we can adopt. It was surprising how comfortable and normal adoption was for us. It certainly isn’t easy. But, then, biological parenting is not easy. Just as there are unknowns in having biological children, there are no guarantees in adoption, especially special needs adoption. The communication about Della’s medical condition was limited which we understood. We weren’t certain what her condition was. We had a video of her which helped to prepare us. 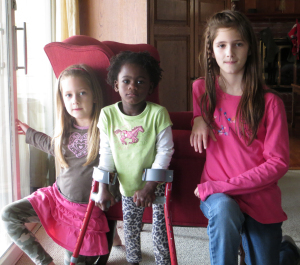 We spoke with other parents and researched orthopedic surgeons. We struggled to find the right doctor since few American doctors have experience treating polio. Being close to Johns Hopkins hospital has given us wonderful care for her. Since she has been home she has progressed from crawling to dragging one leg, to a walker and now she is using forearm crutches. The Physical Therapist is amazed with her progress. Nothing stops her! Adoptive families need a support system We highly recommend that adoptive families find a support group. It doesn’t have to be a large group of people and it’s very informal. We started meeting every other month with our friends who had adopted from Guatemala and DRC. Over time our two families grew to three families and then more and more families began attending. Fifty people attended our last support session including all of the children. It is reassuring to talk with other adoptive parents and hear that they are having similar feelings and experiences. It’s also been great for the children to play with kids from other adoptive families. It is so helpful! Empowered to Connect We attended the Empowered to Connect Conference in September. The information presented there was amazing. We formed a study group that meets every other month to study Dr. Karen Purvis’ The Connected Child. It describes a different way of parenting, a very positive way. We love that it encourages appreciating and listening to your child in the moment of disciplining. We begin a lot of our conversations with “I understand but” so that we are giving a voice to Della. It encourages a non-traditional approach to parenting, which may be the best approach to use with a child who has come from a hard place. Embrace Adoption We hope that sharing our story will persuade other families to consider special needs adoption. This is not something we expected to do. But, when the opportunity presented itself to us, we embraced it. Do some research before you say no. There are such tremendous resources available to parents in this country. We figured we could get the medical care she needed or modify our home if necessary. A child being part of a family is bigger than any special need. 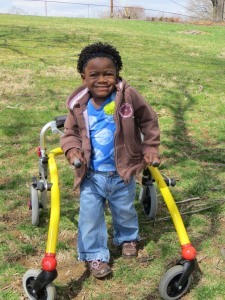 We encourage others to see that adopting a child with special needs is possible!